Delfy is the ultimate solution for social & media listening. Big Data scraping, proprietary graphic engine, artificial intelligence and much more. 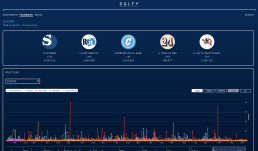 Delfy acquires, elaborates and enriches data from Social Media, Newspapers and media such as TV, radio, YouTube, etc. Through an extremely sophisticated infrastructure, the large use of AI and thanks to the most recent front-end technologies, Delfy is the strongest and most immediate tool for: strategy, market analysis, digital development, social media management, business intelligent and much more. Through our proprietary scraping solutions and the official Facebook API, Delfy can acquire big data from any source in total independence with the highest performance. Big data from any source are elaborated by our algorithms enpowered by artificial intelligence and machine learning, then they are moved to mathematic/statistic integrations and finally to the front end, which displays intuitive interactive plans. Our aim is to synthetize complex information from Big Data, simplify and make them understandable just by sight. Information originated from various sources are easily integrated and related between each other. Delfy team is composed by: data scientists, AI experts, mathematics and experts in traditional and digital communication. Every member makes his competence available to the team, to express useful and incisive recaps about any aspect of our clients’ business.